This article first appeared in The Edge Financial Daily, on March 15, 2018. Aladdin and The Magic Lamp is a romantic tale of a peasant and his princess, combined with magic tricks and performers wearing elaborate and vivid costumes. A whole new world is brought to life, transporting us to the land of Agrabah as seen in the Aladdin and The Magic Lamp showcase, now taking place at Resorts World Genting. 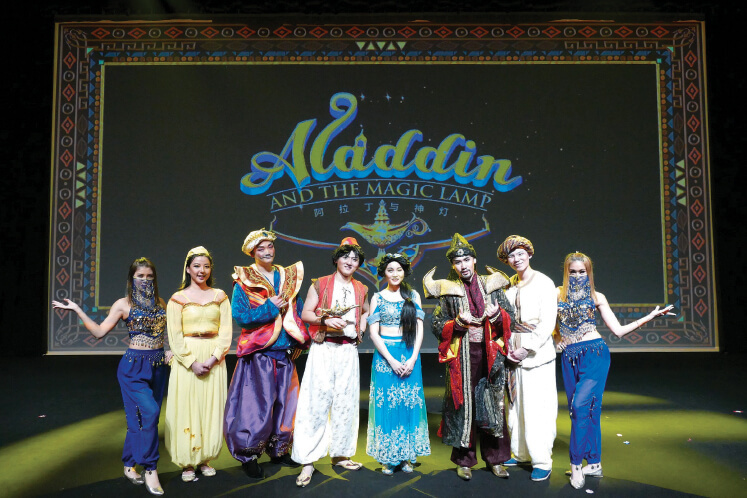 This entertaining production by China’s DT Kids Theatre provides a unique twist to the classic Arabian Nights tale of a poor tailor’s apprentice who discovers a magic lamp and the genie inside it. Screenwriter Yin Heng has rewritten the story specially for the show, combining top-notch live performances and state-of-the-art three-dimensional (3D) holographic projections of beautiful animation. The romantic tale of the peasant and his princess, combined with magic tricks and performers dressed in elaborate and vivid costumes, got the audience in a rapture. The 3D projections added to the razzle and dazzle. The young ‘uns in the audience were particularly drawn to standout scenes such as Aladdin hurtling away from a big rolling fire boulder, and the evil magician summoning colossal spears of sand to bring the genie to life — the comic timing here was impeccable. Another highlight was the audience participation at certain parts of the show. Shortly before it ended, the audience joined in a sing-along performance of catchy original songs exclusive for the show such as Oasis and Make a Wish. It was memorable. Produced by DT Kids Theatre chief director Zhang Yi and choreographed by Mic Thompson — a Disney dance production veteran who has shared the stage with Michael Jackson and Jennifer Lopez — Aladdin and The Magic Lamp is a visual delight. Also featuring music by Wang Lingyun, the 65-minute English-language production, with Chinese subtitles, is a must-watch. “We had an amazing time for half a year perfecting the story and playing around with the setting of the story and the costumes, aimed at adults and children alike. Aladdin and The Magic Lamp is held at 8.30pm, from Monday to Saturday, with a 4pm matinee show on Saturdays. On Sundays, it is held at 5pm. The showcase takes place at the Genting International Showroom until March 25. Tickets are at RM86 (PS1), RM116 (PS2) and RM156 (VIP), with a 10% discount applicable for Genting Rewards Members.